_ Chamber music has become rather popular with progressive rock fans, especially with the rise in the popularity of bands like Aranis, who embrace the philosophy of both classical chamber music and rock as well (even though it’s well hidden sometimes). So it’s no surprise we find an album celebrating rock in opposition through the eyes of a chamber quartet. We get a few new versions of some well-known composers, like Frith, Denis, Johnson and some new ones as well. Snake Eating Its Tail is from Cosa Brava's Ragged Atlas, while the second and third titles here are from Frith's solo album Gravity. The fun thing about these 3 tracks is observing which instruments the chamber instruments replace and how it changes the feel of the music. I think the charm, overall atmosphere and intention are still there, but with perhaps not as much rock impact. Then we're in for some Thinking Plague reconstruction surgery, which comes off sounding pleasant, but really doesn't have the same impact as the original. The Univers Zero piece is actually pretty close to the original, but without all the great accents from Daniel Denis's tremendous drumming and without the keyboard fullness. A very good version, nevertheless. Next is a piece by Massimo Giuntoli, who actually plays piano on the track. This piece probably sounds the most natural piece for a chamber ensemble on the whole album – nice build-ups and contrasts. The Zago piece comes from Yugen's first album. The band does an admirable job on this highly complex piece of music. Next is a piece from one of the quartet members, Emilio Galante. Again, it seems to sound more natural than the first half of the album, where they covered the classics. The final two pieces belong to two relatively new Italian composers, associated slightly to rock in opposition (mostly a Fred Frith connection), Stefano Zorzanelllo and Tiziano Popoli. Again, these are very smoothly played compositions, which fit the chamber mould perfectly. The whole album is like taking rock in opposition music and bringing it back to basics with classical instruments. It shows that the music has much merit in that context. The rock element is really something that gives this kind of music an edge, which is missing here. I can't really speak for much about the second half of the album. Except for Yugen, the music was new to me. It impressed me more than the pieces I was familiar with, but that might have something to do with my preconceptions of what these pieces should sound like. We get a few pieces by classic era artists and a few newer compositions, so all in all a nice mix. Perhaps we could have a few more volumes, covering bands like Art Zoyd, Present, 5uu's and a few newer artists as well. The ensemble obviously has the skill to do it, but is it really worth their time? I for one greatly prefer the originals, but it might be just me. 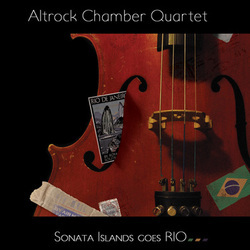 A review copy was provided by the record label Altr0ck.